Got back from Vegas last night to come home to flooding. Not to worry my house is fine but downtown area wasn't so lucky. I drove around this morning to take a few pics of the floods but the water had already receded so there wasn't much to take a pic of. I wasn't able to see much on my way home last night because it was already dark. I could see some reflections of light in the streets so I knew there was water and the roads were closed. It is still raining today but we are supposed to be getting a break tomorrow before the rains return. Since I didn't get any flood pics I'll share one with you that I found on one of the local news sites. This is from downtown Sultan. I usually drive this road every day to and from work. Michael, my contractor, took some flood pics on his way home from work yesterday and they can be found on his Flickr page. I didn't get any flood pics but I did get a few Vegas pics. 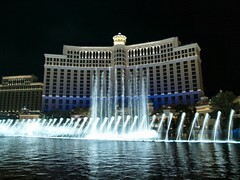 We stayed at Bally's which is right across the street from the Bellagio. You can see the rest on my Flickr page. We went to a couple of buffet's. One at the Flamingo and one in our hotel at Bally's. I liked Bally's buffet better. Both had some pretty good food though. I can't even remember what all I ate but I'll mention a few things I can remember. I had some mashed tatos, salmon, swordfish, crab legs, sushi, chicken coleslaw, green salad, steak, green beans, sweet & sour chicken, shrimp coctail, breaded shrimp, and more I can't remember. We spent a little time gambling but not too much. We started out with a little bit of slots for my mom. We aren't big slot machiners but I told my mom I'd play a few for her and I did and I didn't win the big one. We also played some bar video poker. Didn't do much there either but we did get a few drinks comped so I guess it was worth it. We decided to take the free shuttle from Bally's to the Rio in search of some $5 blackjack tables of which we found none. The Gold Coast was nearby and I was pretty sure they had some so we walked over there and they did in fact have some. So I sat down and had a rough start but things started looking up and I turned $40 into $100 not too bad. I decided to quit while I was ahead and we headed back to our hotel to watch Seattle spank Oakland in Monday night football. I really didn't think they'd win. We both put bets down on the game. Doug picked Seattle and I picked Oakland. I obviously lost. We watched the first half on the big screen at the Indigo Lounge in Ballys then went to eat at the buffet. 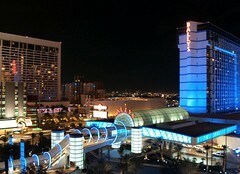 Later we decided to try some tables at Bally's I had to settle for $10 blackjack an got spanked. Lost the winnings I made at the Gold Coast so I came out about even for the trip. They really need some $5 tables at Bally's!